Seinfeld's pleasingly idiosyncratic comic voice comes through in the haphazard, slaphappy storyline. 91 min. DreamWorks SKG, Paramount Pictures. Directors: Stephen Hickner, Simon J. Smith. Cast: Jerry Seinfeld, Renee Zellweger, Kathy Bates, Oprah Winfrey, Matthew Broderick. Jerry Seinfeld's comedy has always been microscopic, about the little things we notice in a kind of semi-consciousness, but which the comedian is able to bring into focus for us. It's appropriate, then, that Seinfeld's first major project since his blockbuster sitcom Seinfeld would be the story of a tiny creature flying about New York in a cheery defiance of physics. 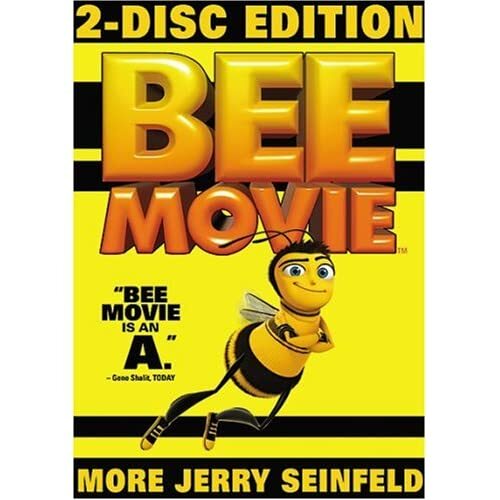 Seinfeld has always had a fascination with bees and their seemingly impossible existence, which happily makes Bee Movie quite a bit more than the jokey title that spawned it. Of course, there's nothing "B" in Hollywood terms about Bee Movie, which gets the A-level talent of DreamWorks behind it (including the hands-on executive guidance of Jeffrey Katzenberg and Steven Spielberg). To complement the unconventional script by Seinfeld and his familiar roster of Spike Feresten & Barry Marder & Andy Robin, the DreamWorks Animation team gives the picture a busy-as-a-bee visual pace and a sunny-day color scheme. Seinfeld's pleasingly idiosyncratic comic voice comes through in the haphazard, slaphappy storyline. The star applies his persona to Barry B. Benson, a bee who critiques and questions the ways of the world around him. Unsatisfied to tie himself down to a lifetime of hive toil, he takes an unscheduled trip outside the hive, meets a girl (yep, a human girl played by Renée Zellweger), and sues humanity for ripping off honey. It's all bright, brisk, colorful, and just a bit subversive, including a passing joke about the possibility of a suicide pact. You wouldn't hear that in a Disney movie. At its core, the story is a play on The Graduate, with just-graduated Barry pressured by his suspiciously Jewish-seeming parents (Kathy Bates and Barry Levinson) to choose a job and settle into a hive existence; there's even a pool scene patterned on the Mike Nichols classic. Barry's friend Adam (a winning Matthew Broderick) worries up a storm at the notion that Barry has met a girl: "Is she Bee-ish? Not a wasp?" The voice cast includes plenty of Seinfeld friends, including usual suspects Patrick Warburton, Larry Miller and Michael Richards, as well as Chris Rock (as opinionated mosquito Mooseblood), John Goodman, Rip Torn, Oprah Winfrey, Ray Liotta, "Bee Larry King," and wait for it...Sting. Though the humor is on the mild side, it's enough to keep parents smiling as kids gape in wonderment at the imaginative story of insects talking to humans and the stimulating animation, depicting the fast-paced life of the bee within the hive and the dangers of the outside world, from tennis balls to getting embroiled in a fencing match pitting stinger against human-brandished thumbtack. And messages, we get messages: tolerance of those different from us and the delicate balance of the environment. Though much of the time the movie is not so much funny as whimsical, Seinfeld's verbal acuity (assisted by three other writers) is distinctly in evidence. Offered a pastry, Barry says, "I'm trying to lose a couple micrograms...these stripes don't help." Conversational digressions occasionally veer into vintage Seinfeld territory, as when Barry questions toe rings: "Why do girls put rings on their toes?...It's like putting a hat on your knee." He may not be playing live here, but any time Seinfeld stands up to the mic, you can bet on at least a few nuggets of comic gold. Paramount flies back onto Blu-Ray in high style, with this fully-loaded special edition (duplicated on DVD) that will make kids and Seinfeld fans alike giddy with pleasure. The picture itself is presented in dazzlingly sharp, vibrantly colorful detail, with a strong Dolby TrueHD soundtrack that doesn't miss a beat. Paramount gives several options to enhance one's repeat viewing of the film. First and foremost is a lively commentary with Jerry Seinfeld, directors Simon J. Smith and Steve Hickner, writer Barry Marder, and co-producer Christina Steinberg. The wide-ranging chat sometimes slips into "Oh, I love this..." territory, but it's well worth a listen as the fivesome point out interesting visual trivia and discuss the film's long development (from earlier versions like one with a villainous Eric Idle to the film's "wrap" party at the world's best pizza place (hint: it's in Arizona). On Blu-Ray, one can also watch the film after first enabling "The Animators' Corner"—a feature-length picture-in-picture storyboard reel, or "The World of Bees" allowing interactive access to "the scoop" on the characters and the actors, or "Barry's Trivia Track" popping up with notable facts about the movie, the actors, and bee science: it's one of the most enjoyable trivia tracks I've watched in a while. (If you're like me, you'll want to multi-task and double up with a subtitle track and the commentary.) Another nifty bonus on the Blu-Ray edition is My Menus, the option of customizing the menu to "Barry," "Vanessa," "Mooseblood," or "Original" style. Last among the Blu-Ray exclusives is the cute Build-a-Bee feature, allowing kids (or adults) to choose from a variety of hairstyles, accessories, and bee outfits to create their own avatar. But wait, there's more—much, much more (and on Blu-Ray, all of it comes in glorious HD). Once can start with three "Lost Scenes" (5:00 with "Play All" option) in animatic form: "Barry Interview" (2:12), "The Queen" (1:48), and "Liotta on a Plane" (1:12); it's only a shame we don't get more of these. But we do get six "Alternate Endings" (14:39 with "Play All" option): "Ben and Vanessa Fly Off Together" (2:43), "Tragic Love Triangle" (1:34), "Spanish Fly" (2:46), "Outer Space" (3:52), "Ken Flies Ultralight" (2:16), and "The Eagle Has Not Landed" (1:56). The Lost Scenes and Alternate Endings all get a brief audio intro by Seinfeld, schooling us on the vagaries of the development process. NBC viewers will recall Jerry's ubiquitous NBeeC "TV Juniors" (23:20 with "Play All" option), and all 16 arrive on home video; they're entertaining toss-offs spoofing the making of the movie. The promotional blitz is also represented by two Live-Action Trailers (4:12 with "Play All" option): "Windshield" (1:55), featuring Seinfeld, Chris Rock, and Eddie Izzard, and "Steven" (2:15), adding Steven Spielberg to the mix. And then there's the "We Got the Bee" Music Video (2:13), which—despite Seinfeld's presence—is strictly for hyperactive kids weaned on commercial-heavy cartoon broadcasts. "Jerry's Flight Over Cannes" (3:03) is a brief behind-the-scenes featurette about the film's most notorous bit of promotion: having Jerry take flight in a giant bee suit. Taken together, "Inside the Hive: The Cast of Bee Movie" (14:40) and "Tech of Bee Movie" (7:33) are the closest things to a straightforward making-of doc. The former gathers Seinfeld, Steinberg, the directors, editor Nick Fletcher, and much of the cast: Matthew Broderick, Renée Zellweger, Patrick Warburton, Chris Rock, Megan Mullaly, and Larry Miller. It's also an opportunity to witness Warburton send Seinfeld into hysterics. "Tech of Bee Movie" includes interviews with Seinfeld, the directors, and DreamWorks Animation artists as they describe challenges like bee "crowd scenes." "Meet Barry B. Benson" is an annoyingly constructed series of 11 Qs and their As, each very brief and padded with clips from the film. Instead of presenting them as a single featurette, the viewer must navigate to and select each question with a few clicks, too much trouble for a couple of wan Seinfeld quips. DreamWorks promotions include Trailers for Kung Fu Panda, Madagascar: The Crate Escape, and The Spiderwick Chronicles, as well as the DreamWorks Animation Digital Jukebox, with musical clips from Shrek, Shrek 2, Shrek the Third, Flushed Away, Over the Hedge, Madagascar, and Shark Tale. Lastly, there's a DreamWorks Kids section, with the aforementioned "Build-a-Bee"; featurette "The Buzz About Bees" (7:08), teaching kids about bees and how to make a bee box for the garden; "The Ow! Meter," which profiles, and ranks in terms of hurt, five types of bee and five types of bee-swatting by humans, as well as teaching "How to Avoid Getting Stung by a Bee"; and "That's Un-Bee-Lievable," a trivia quiz. This is one Blu-Ray that pulls out the stops in making a case for your shelf space. All site content © 2000-2019 Peter Canavese. Page generated at 04/24/2019 07:16:04AM.